Jeep's First Mid-Sized Truck in 27 Years. Engineered to provide off-road performance and the ability to haul everyday items, the brand new Jeep Gladiator has been revealed with a long list of features. Premium lighting will be important for this off-road beast whether you are hauling your boat to the lake or hitting the trails at night. Engineering the best LED Lighting options so that your truck has increased visibility at any moment is a high priority at Diode Dynamics. At Diode Dynamics, we offer many LED upgrades for your 2020 Gladiator. 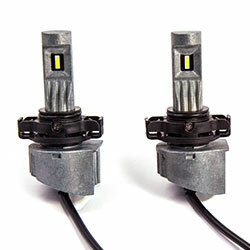 You can find our most popular LED bulb replacements for your hi/low beams, front turn signals, and fog lights below. Sign up for our newsletter to stay up-to-date on the latest LED lighting upgrades for your 2020 Jeep Gladiator!